Once the thrill and anticipation of Christmas has passed, winter takes on a different mood. I go from all warm, cozy and curled up by the fire to so cold I loathe every drop in degree. Winter just doesn't seem as romantic after Christmas. It just seems cold. Now it doesn't help that I live where it gets down right chilly. A special kind of chill that lasts FOR-EV-ER...I am being a tad bit dramatic. Basically, it is cold and I am not a fan of being cold. Being cold makes me want to dress in over-sized sweaters and big chunky socks and stay curled up in a blanket.I want to snuggle with my warm and cozy children. I want to drink mug after mug of hot cocoa and slurp bowl after bowl of soup. Seeing as I don't want to unravel myself from my blanket or put my cozy kids down, I also don't really want to slave over dinner. Yeah for the return of my slow cooker a month ago. Now I can throw dinner together in the morning whilst still in my jammies. Then it just cooks away all day long whilst I remain cozy...yes I said whilst twice in two consecutive sentences. 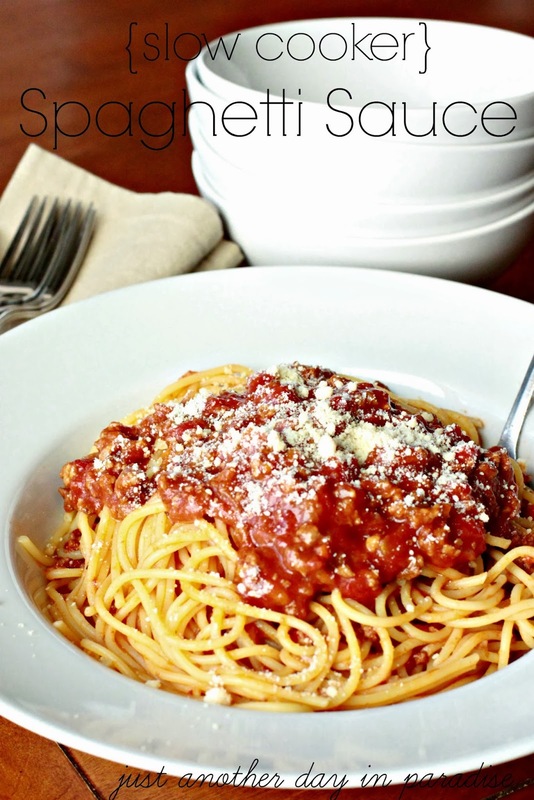 For this first Slow Cooker Saturday of 2014, I am sharing this Slow Cooker Spaghetti Sauce. This sauce is great! Super packed with flavor and there are some extra hidden veggies in the sauce. A double win. The recipe cooks all day long, so the flavors in this sauce are amazing. We loved this sauce at our house. In fact, we were able to eat spaghetti for two nights in a row. This recipe makes a big family sized amount. We have leftovers for more than one meal. If you have read this blog for awhile, you know I am not always the biggest cheerleader for leftovers. Even if I really loved something the first time, I may not always want it reheated. So when I do eat leftovers, that is a big deal. HUGE. I ate these for leftovers, and enjoyed this spaghetti just as much the second night. Heat the olive oil in a skillet. Brown the hamburger and the sausage for 5 minutes. Add the garlic and onions and saute for several more minutes, until the meat is browned. Drain fat. Place the meat mixture into the bottom of a slow cooker. Add to it the tomatoes, carrots, tomato sauce, bay leaves, oregano, basil, salt and pepper. 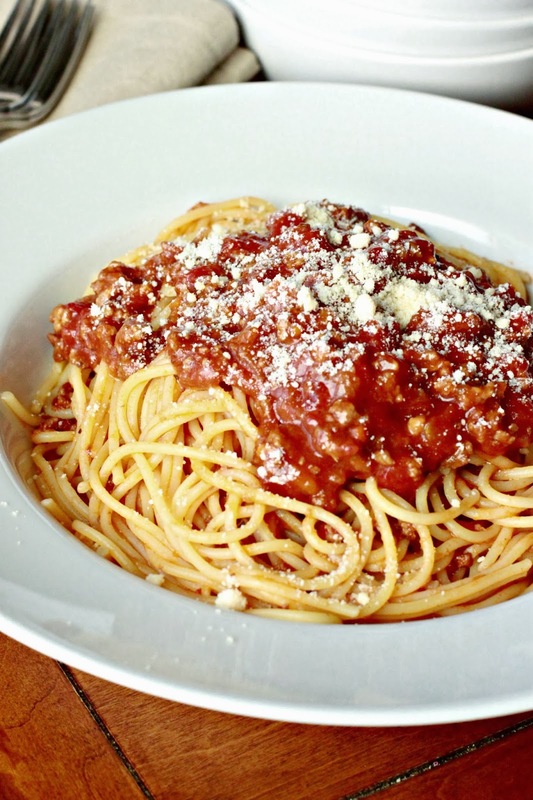 Serve immediately on spaghetti noodles.